What Days Can I Water My Garden in Perth? 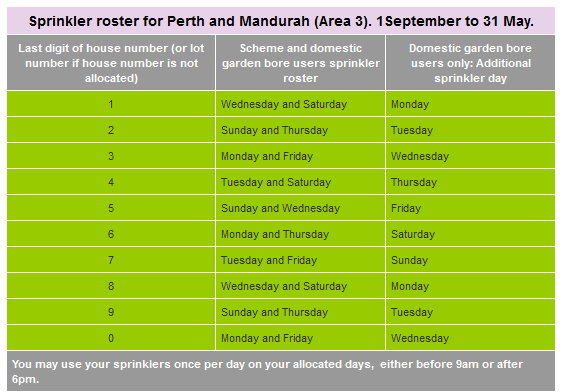 Sprinkler restrictions apply in the Perth and Mandurah areas from 1 September to 31 May each year. Also, in winter, there is a total sprinkler ban in force from 1 June – 31 August. The sprinkler roster for scheme water users (who draw water from the mains via taps) is 2 days a week. The current domestic bore water sprinkler roster is 3 days a week (and not unlimited use as some people believe). What Days Can I Water? The last digit in your house or lot number determines the days of the week that you can use your sprinklers or reticulation. The following graph shows the last digit of your house/lot number on the left with watering days in the middle and the extra day for domestic bore users on the right. Please remember that you can only use your sprinklers once on your allotted days, either before 9am or after 6pm. To see the source of this information, visit the WA Government Department of Water website (will open in new window). We are Western Australia’s bulk water cartage specialists, supplying demineralised, potable and raw water for a variety of industrial, mining, farming and pharmaceutical purposes. For more details please call (08) 9410 1726 or email using the contact form on the right.